Border Songs, a double-CD set of music and spoken word about the border and immigration, calls attention to the tragedy on the US-Mexico border, while raising money to aid migrants and people who have been deported to Mexico. Produced in Arizona, a state renowned for its anti-immigration policies, the album features musicians, writers, photographers, and artists who are using music and art to send a message and save lives. Border Songs features thirty-one performances in both English and Spanish from a variety of genres and styles including blues, corrido, cumbia, folk/Americana, hip hop, instrumental guitar, mambo, Nicaraguan new song, reggae, rock, and even an electronic recording of the wall itself. All proceeds from the sale of the Border Songs CDs will go to No More Deaths/No Más Muertes, a volunteer group that caches water in the desert, provides medical assistance and food to migrants, and helps recently deported people on the Mexican side of the border. Since 1994, more than seven thousand migrants have died along the US-Mexico border. Each purchase will provide twenty-nine gallons of water, or the equivalent in food or medical supplies to people in need. For more information, go to bordersongs.org. Waxwing is grateful to the generosity of Pachuco y Classik, Arizona-based rappers; Sergio Mendoza y la Orkesta; and Christa Sadler, a volunteer for No More Deaths/No Más Muertes, in allowing us to feature their songs. 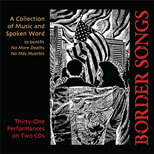 Other musicians that contributed to Border Songs include Pete Seeger, Sweet Honey in the Rock, Calexico, Michael Franti and Spearhead, Robert Neustadt, and many others. See the complete list of artists here. Buy the complete two-disc set here. More information about the Border Songs project and No More Deaths/No Más Muertes is available here.